Most objects in a 20-sim Animation can be shown with a preset color. 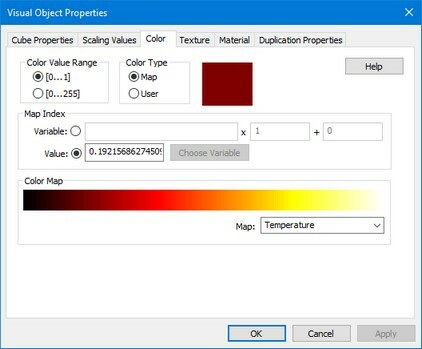 The colors can be user defined or defined with respect to a color map. The additive primary colors are red (R), green (G), and blue (B). By mixing these colors in different percentages, any other color can be created. When blue and green are mixed, the resulting color is cyan. When blue and red are mixed, the resulting color is magenta. If all three primary colors are mixed together, the resulting color is white. Color ranges can be set from 0 to 1 or 0 to 255. 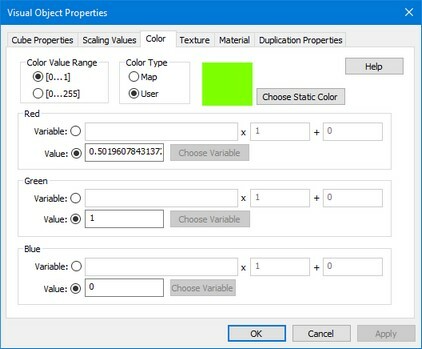 Constant values or model variables can be chosen for each primary color. Use the multiplication and addition terms for scaling and offset. The color that is chosen is defined by a color map. Color ranges can be set from 0 to 1 or 0 to 255. A constant value or a model variable can be chosen. Use the multiplication and addition term for scaling and offset.